After the dust settled from Kentucky's 71-63 victory over West Virginia in the second round of this year's NCAA Tournament, everyone's focus was squarely on the Wildcats star freshman Brandon Knight, who scored a career-high 30 points and his coach, John Calipari, who notched only his second victory over Bob Huggins in 10 tries as he and Kentucky earned another trip to the Sweet 16. Somewhere in the West Virginia locker room, far away from all the cameras and Sweet 16 talk, sat Joe Mazzulla, a fifth-year senior who had just played the last of his 145 games for the Mountaineers. Besides the number of games he played, no other statistical achievements of Mazzulla's career would make anyone look twice. With career averages of 4.8 points, 2.4 rebounds, and 2.5 assists it's not hard to see why he was often overlooked, but the numbers don't tell the whole story of Mazzulla's career at West Virginia. Mazzulla was a member of the last class that was brought in by John Beilein before he left for Michigan and one which had the daunting task of trying to replace players like Kevin Pittsnogle, Mike Gansey, and Johannes Herber who led the Mountaineers to the Elite Eight and Sweet 16 during their junior and senior seasons. When you consider that Mazzulla entered West Virginia at the same time as Da'Sean Butler, Wellington Smith, and Jonnie West (yes he's the son of legendary West Virginia basketball player and NBA icon Jerry West) it's not difficult to see why a 6'2'' left-handed point guard from Rhode Island who wasn't near the top of any recruit rankings didn't garner much attention. After all, Mazzulla was an undersized player who wasn't a great shooter, didn't possess elite athleticism, and for the most part, didn't do things on the court that made you jump out of your seat. At the same time, the way Mazzulla played the game reads like a list of every cliche ever penned by a sportswriter (most of which you will no doubt hear in this article) and he made up for whatever he lacked in skill or size with a pretty amazing set of intangibles. The Bishop Hendricken product was one of the toughest players in college basketball who was always willing to do the little things to help his team win. Whether Mazzulla was taking charges, diving for loose balls, making the extra pass, or just being a leader, he found ways to affect the game without putting up eye popping stats. Throughout his career, Mazzulla was the kind of guy opponents hated playing against because they knew he was going to fight for every inch of the court and not back down from anyone. His resiliency and commitment to the game of basketball were tested on multiple occasions over his five years at West Virginia and regardless of the obstacle, Mazzulla persevered and continued to follow his passion. You could point to the two times Mazzulla was arrested, once for a domestic violence incident at a Morgantown club and once for resisting arrest and underage drinking at a Pittsburgh Pirates game. Both of which were regrettable episodes that Mazzulla worked his way through and hopefully became a better person because of. But Mazzulla's biggest test came when he fractured the growth plate in his left shoulder just six games into his junior season, a very serious injury which forced him to undergo surgery, endure a lengthy rehabilitation period, and nearly ended his basketball career altogether. In what was an extremely unfortunate turn of events, Mazzulla's injury struck just when he had been named the Mountaineers starting point guard and was beginning to assert himself as a game changing player. 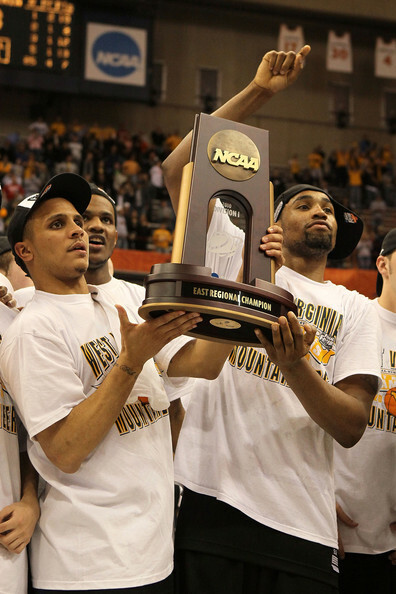 In fact, Mazzulla was just a few months removed from his legendary 13 point, 11 rebound, 8 assist performance against Duke in the second round of the 2008 NCAA Tournament which helped West Virginia advance past the Blue Devils and earn a trip to the Sweet 16. Mazzulla sat out the rest of the 2008-09' season as he embarked on the long road back from a surgery which left him unable to lift his left arm above his head and kept him in constant pain. Despite the setback and the fact that he had to learn to shoot free throws with his right hand, Mazzulla was ready to go by the second game of the following season. Although he essentially couldn't shoot the ball, Mazzulla focused on doing other things which could help West Virginia win, a familiar place for a player who was never blessed with an incredible scoring touch or great size. 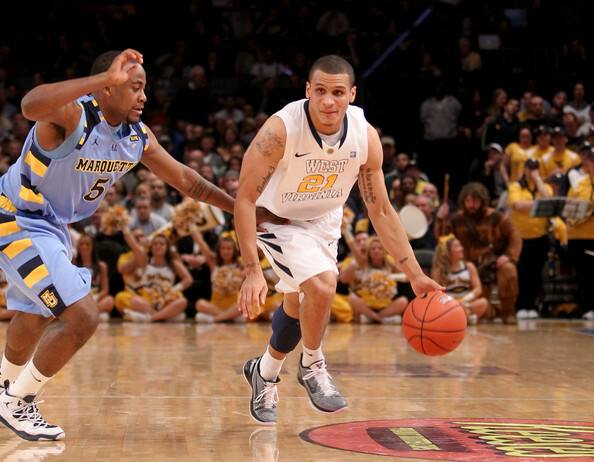 During the 2009-10' season, Huggins eased his junior point guard into the lineup and by the time March rolled around, it was clear that Mazzulla was beginning to round back into form. A West Virginia team which had serious aspirations of making a deep tournament run was dealt a terrible blow when Darryl Bryant broke his foot during a practice right before the Sweet 16. This was certainly not an ideal situation for the Mountaineers, but Bryant's absence gave Mazzulla a chance to play a bigger role and he responded with one of the most incredible and unexpected performances college basketball has seen in some time. 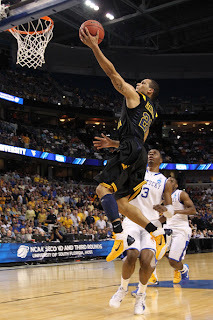 Not only did Mazzulla score a then career-high 17 points in that memorable Elite Eight game, but he was also used by Huggins to frustrate Kentucky's DeMarcus Cousins on the defensive end of the floor, despite the fact that Cousins had a good nine inches and 70 pounds on Mazzulla. Just like he had done for the majority of his career, Mazzulla didn't let his size get in the way and he dug his feet into the ground and battled with the much larger Cousins. His efforts ended up disrupting one of the best post players in college basketball en route to helping the Mountaineers reach their first Final Four in 51 years. As a senior this season and two years removed from his shoulder surgery, Mazzulla resembled the player who had earned the Mountaineers starting point guard spot a few years ago. Coming off the bench, Mazzulla had a predictably solid but unspectacular year from a numbers standpoint. He averaged 7.7 points, 3.8 rebounds, and 4.2 assists for a West Virginia team which went 21-12 and bowed out in the second round of the NCAA Tournament. As always, Mazzulla brought that fearless mentality with him to every game and his will to succeed once again overshadowed any lack of size or talent. Mazzulla's story is certainly unique, but chances are there's a Joe Mazzulla on your favorite team whose hustle, hard work, and dedication to the game of basketball are invaluable and embody what the college game is all about. So while everyone was focusing on Brandon Knight, John Calipari, and the story that had yet to completely unfold for Kentucky, there was a much more endearing story in the West Virginia locker room that had just come to an end. One that was five long years in the making and which saw Joe Mazzulla go from unknown recruit, to tournament hero, to nearly out of college basketball for good, back to tournament hero again, all the while being the personification of college basketball. Somehow, the fact that the end of Mazzulla's career was overshadowed by a more storied program and more talented players celebrating a trip to the Sweet 16 seems like the perfect ending to what had been an imperfect career at West Virginia. Mazzulla didn't always make the right decisions off the court nor was he ever the best player on it, but he never stopped working with what he was given. During that Saturday in mid-March, like he had done for almost his entire career, Mazzulla played a supporting role in someone else's story. Guys like Mazzulla certainly aren't the angle that the media wants to play up with most of their stories about college basketball. To the media and most college basketball fans, guys like Mazzulla are just cogs in the machine who might see a little bit of the lime light once in a while, but by and large they want to focus on the best of the best- guys like Brandon Knight- who ooze greatness with every step they take. These are the guys everyone tunes in to see. They drive television ratings, sponsors, and many of them go on to play in the NBA. But for every Brandon Knight there are 20 Joe Mazzulla's who've poured their heart and soul into simply being a role player at the collegiate level. They are the players who make college basketball what it is and without players like Joe Mazzulla, there are no Brandon Knights. Mazzulla was a beast at hendricken, and if it weren't for that you shoulder injury who's to say the nba was never an option? Pre-injury he could shoot well, his speed was most times unmatched by his opposition, and above all his defense and basketball i.q. was superior than most...It's a shame injury deprived a small town kid a chance at the show but he made the most of his limitations and shined. Agreed, Mazzula definitely got the most out of his abilities after the injury. Loved watching him play at WVU, I won't ever forget the game he had against Kentucky in the Elite 8.